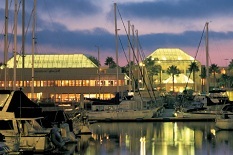 The Portofino Hotel and Yacht Club Redondo Beach overlooks the tranquil Portofino marina. Guests are treated to front-tow viewing of King Harbor’s own colony of California Sea Lions. The guest rooms feature floor-to-ceiling windows and patios or balconies which overlook the ocean or marina. The rooms promote a nautical theme and feature contemporary decors, seashell-shaped lamps, vivid bedspreads and fresh flowers and plants.